SYDNEY: Australia fended off an explosive century from Rohit Sharma to post a morale-boosting 34-run victory over India in the first one-day international in Sydney yesterday. The Australians made 288 for five off their 50 overs after winning the toss and restricted India to 254 for nine. Sharma blasted 133 off 129 balls in a scintillating effort to keep India in the contest, while man-of-the-match Jhye Richardson took four for 26 for Australia. It was a tonic for the ailing Australians, coming off their first-ever home Test series defeat to Virat Kohli’s India and after winning just three of their previous 24 ODIs. Handscomb, passed over this week by selectors for this month’s two Tests against Sri Lanka, led the way with six fours and two sixes. Fellow Test discard Marsh knocked up 54 off 70 balls while Khawaja made 59 from 81. India’s Bhuvneshwar Kumar finished with two for 66 and wrist-spinner Kuldeep Yadav claimed two for 54. “We are not very pleased with the way we played,” Kohli said. “I thought we were fine with the ball, score of 300-plus was par on that wicket. We thought 280 was chaseable on that wicket but losing three wickets in such a short span of time is never good. “Rohit was outstanding and MS Dhoni supported him well but we could have done better with the tempo of the game.” India lurched to a disastrous start, losing three wickets in the first six overs, from which they failed to recover. Shikhar Dhawan was out on the sixth ball of the innings when he was leg before wicket for a first-ball duck to ODI debutant Jason Behrendorff. It got worse for India when Kohli was caught at square leg off Richardson for three and two balls later Ambati Rayudu was trapped leg before wicket by Richardson after a review for a two-ball duck, leaving India rocking at four for three. Former World Cup-winning captain M.S. 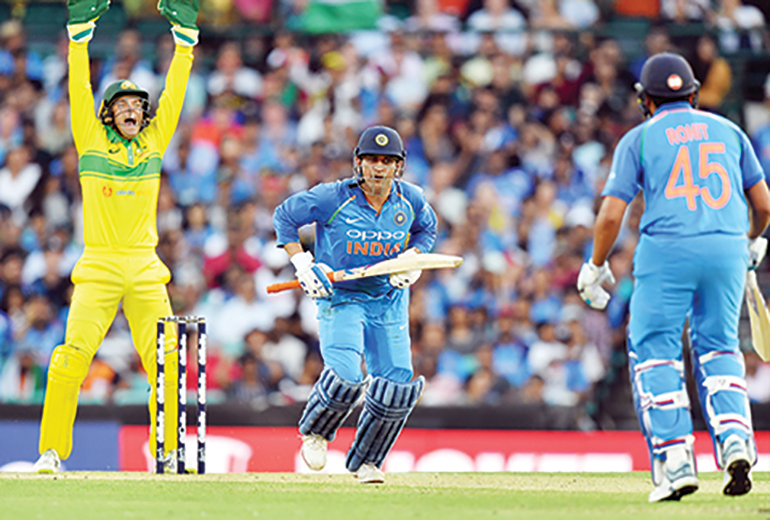 Dhoni put on 137 runs with Sharma for the fourth wicket to stabilise India’s rocky start before he was out leg before wicket to Behrendorff for 51 and his 68th ODI half-century. Dhoni, 37, who has captained India 332 times across the three formats, faced 96 balls and hit three fours and a six. Sharma kept India in the contest with some prodigious hitting, blasting six sixes and 10 fours. But his mighty knock came to an end when he skied Marcus Stoinis to Glenn Maxwell at deep mid-wicket to end India’s remaining hopes. All-rounder Stoinis remained unbeaten on 47 off 43 balls with two fours and two sixes, while limited-over specialist Glenn Maxwell finished 11 off just five balls in Australia’s innings. Aaron Finch fell for six in the third over when he was bowled by Kumar for the paceman’s 100th ODI wicket. Alex Carey fell in Kuldeep’s first over when he attempted to cut the leg-spinner, only to get an outside edge to Sharma at slip for 24 off 31 balls.